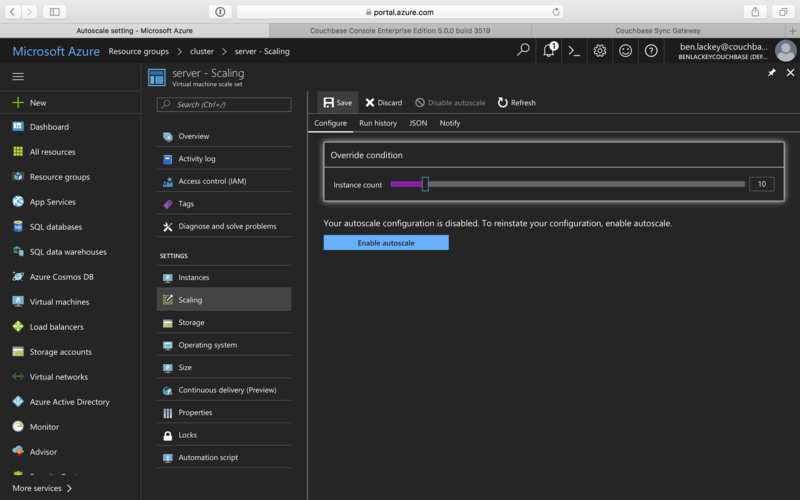 Microsoft Azure Account - If you don’t have an account, you can create one here. 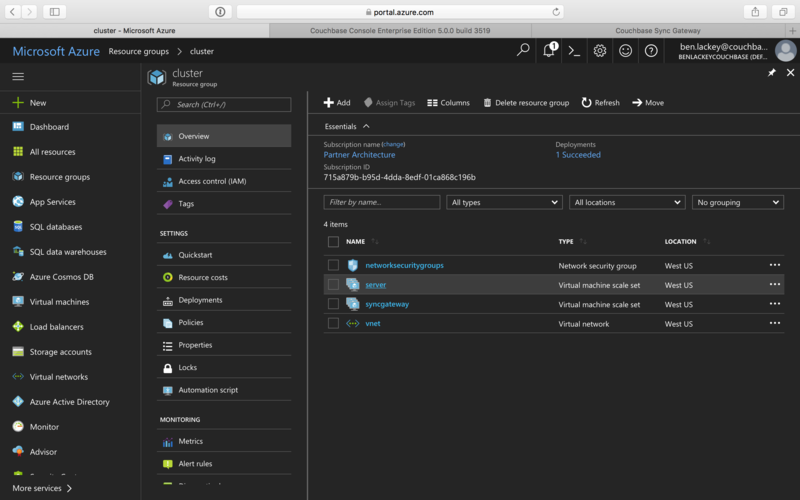 Sufficient Core Quota - The Azure Free Trial is a great way to get started. However, it has a core quota of 4 cores per region. Upgrading the trial to a Pay-As-You-Go subscription will increase that quota to 10 cores. 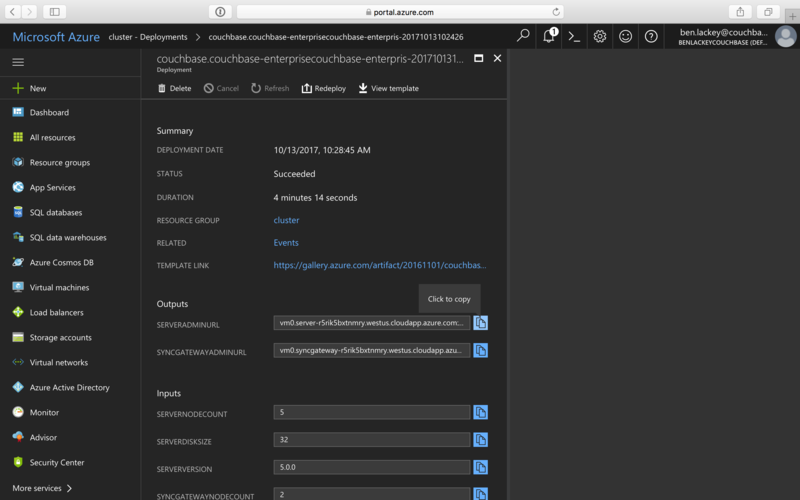 Additionally, for a Pay-As-You-Go subscription you can open a support ticket in the Azure Portal to request a quota increase beyond the 10 core default. 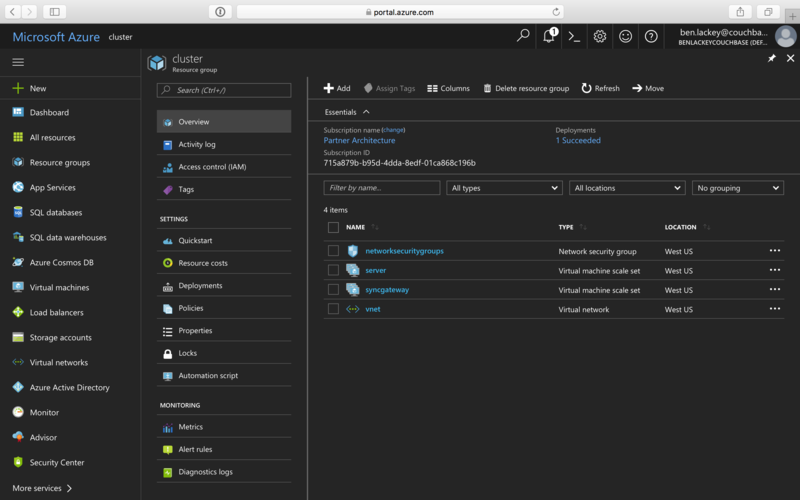 An Azure Enterprise Agreement (EA) has a 200 core quota by default. 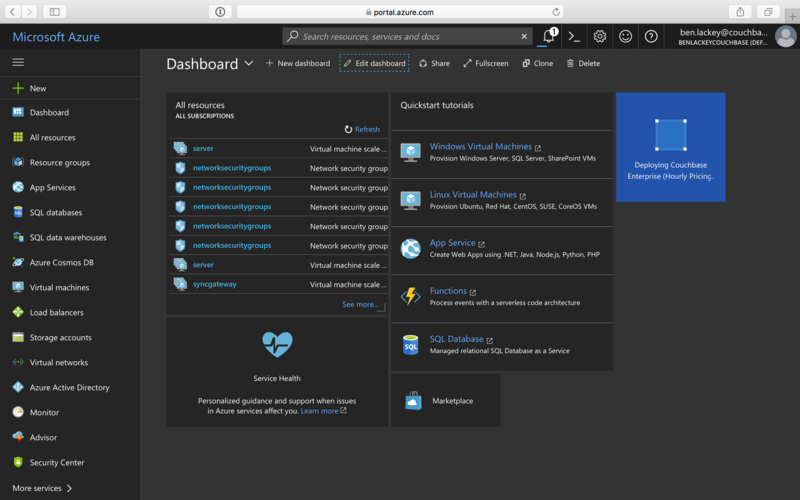 Log in to your account on the Microsoft Azure Marketplace. Search for Couchbase in the Marketplace and select the Couchbase Enterprise app. 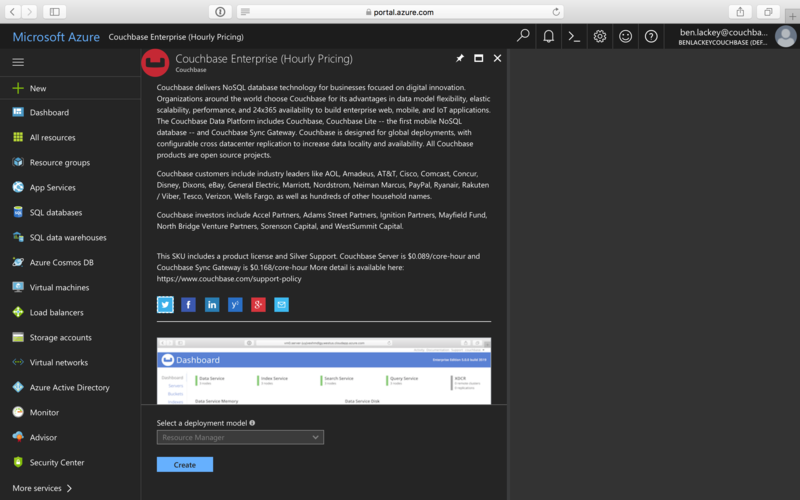 The Couchbase Enterprise product page provides a quick overview of the product offering and useful links. 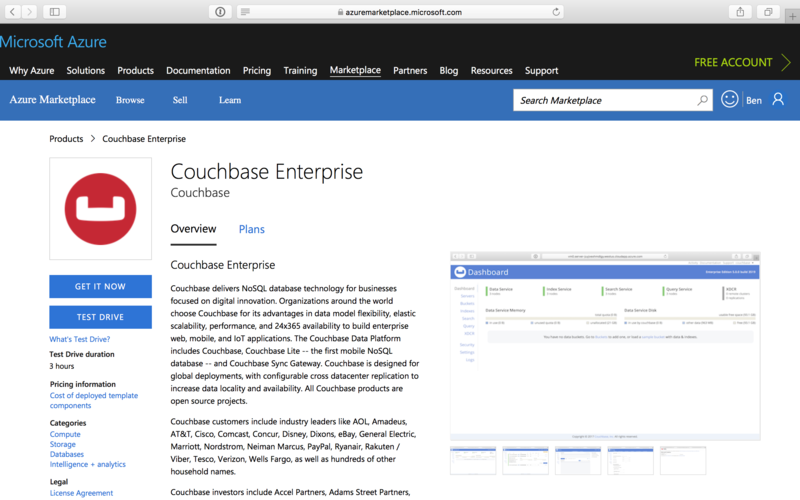 To deploy Couchbase Enterprise on Microsoft Azure, click Get it Now. There are two plans that you can choose from: BYOL and Hourly Pricing. 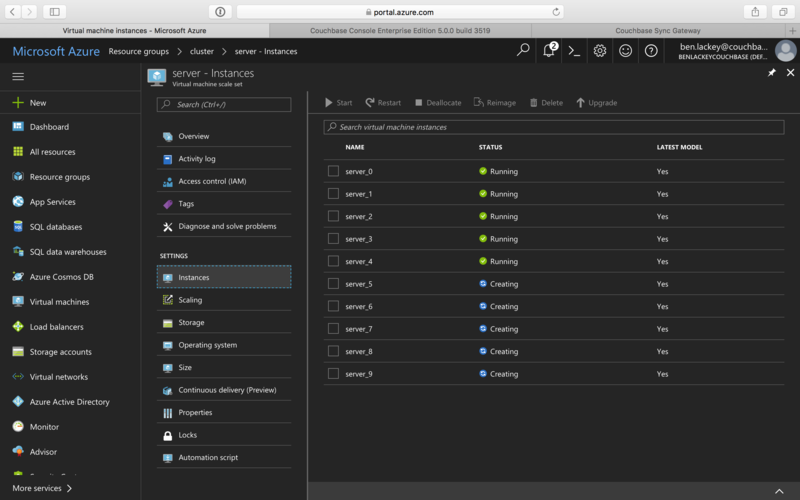 Once you select a plan (we’ve selected Hourly Pricing for this example), you are redirected to portal.azure.com. 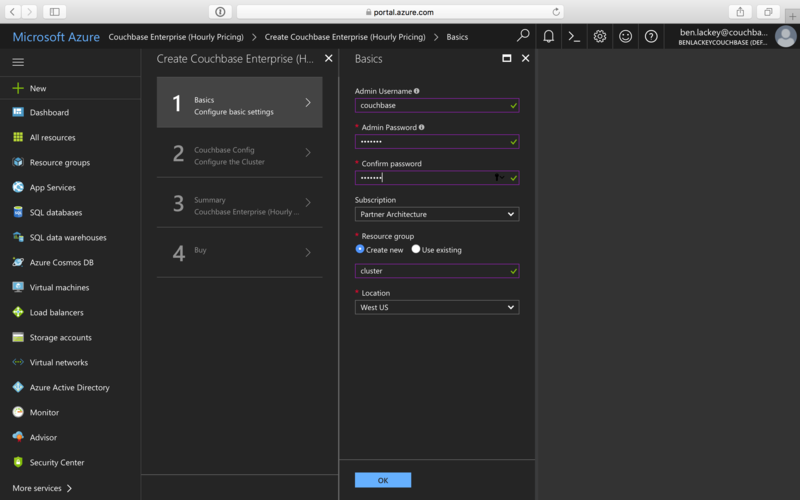 If you’re not already logged in to Azure Portal, you will need to authenticate yourself before proceeding to the next step. 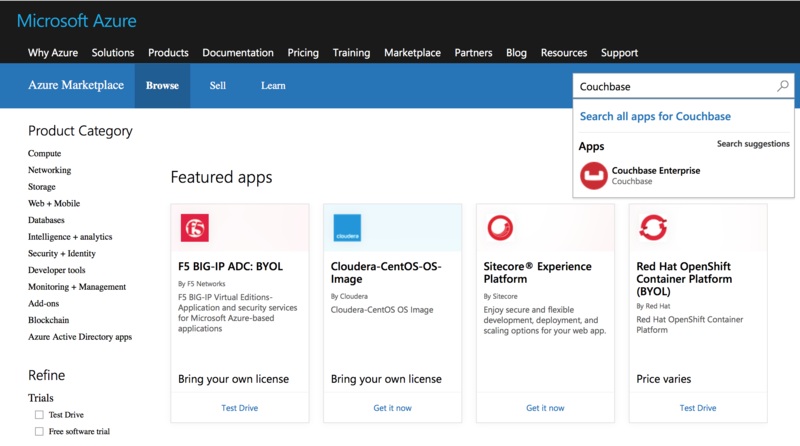 You can also land on this page directly if you have access to Azure Portal and need not go through the initial steps of navigating to this page from the Azure Marketplace. Click Create to deploy and load your first blade. 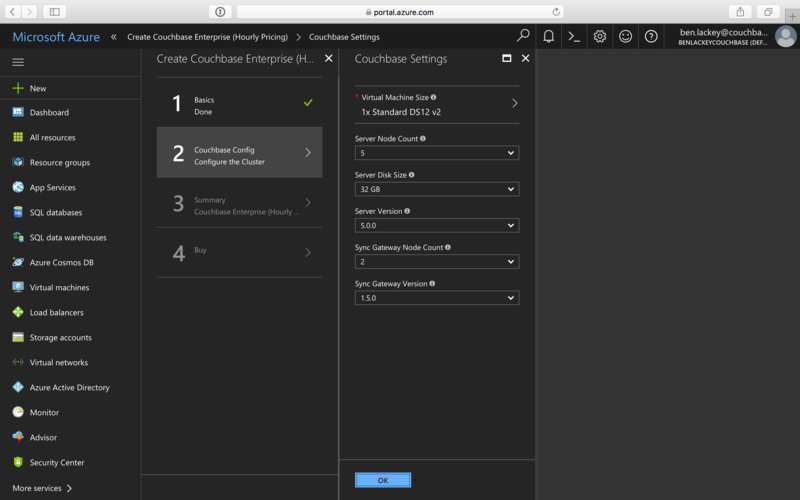 Configure the basic settings for your Couchbase Enterprise. The Admin user name and password you provide on this screen will be used to log in to Couchbase and also to SSH into your machines. Microsoft blacklists a number of user names including 'Administrator', so you’ll need to provide a different user name. The resource group is a logical container for all the things you’ll be deploying such as VM scale sets, disks, etc. Provide a name for the resource group if you choose to create a new one, or select an existing one from the drop-down. Microsoft Azure has a wide range of locations available. 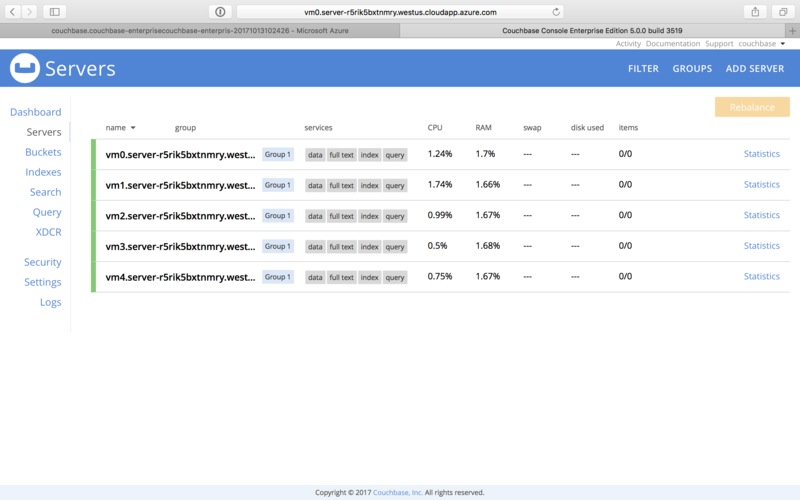 Pick a location where you want your cluster to be deployed. Select the number of server nodes to deploy. 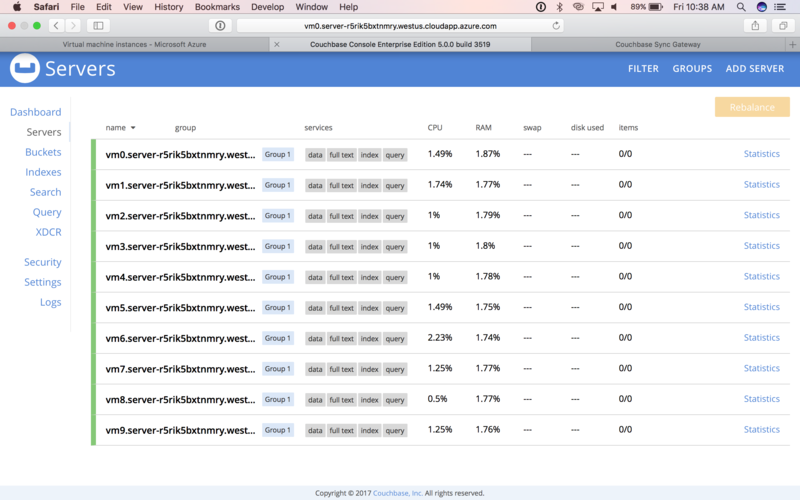 Select the disk size for each of the server nodes. Select the number of Sync Gateway nodes to deploy. Review the summary and click OK to proceed to buy. 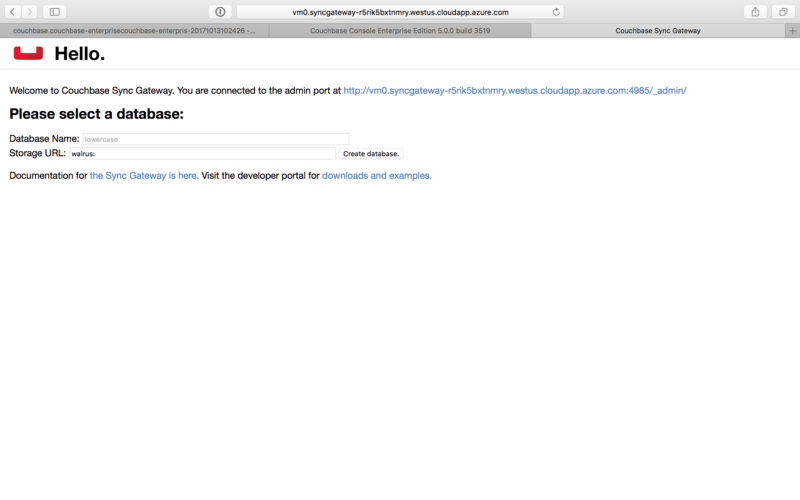 You can also choose to Download the templates and parameters to deploy later with a script. Take a look at the sample templates and instructions to deploy the templates that are available here. Note that these templates are provided as a starting point for and may be customized as needed. Note that additional post deployment setup may be required. 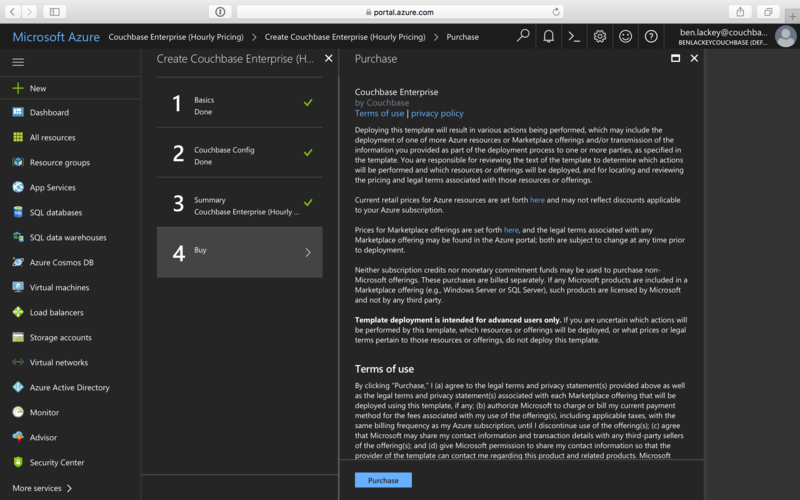 On the final screen, you’re presented with the Microsoft Azure and Couchbase End User License Agreements (EULA). Review the license agreements and click Purchase if you agree to the terms and conditions. 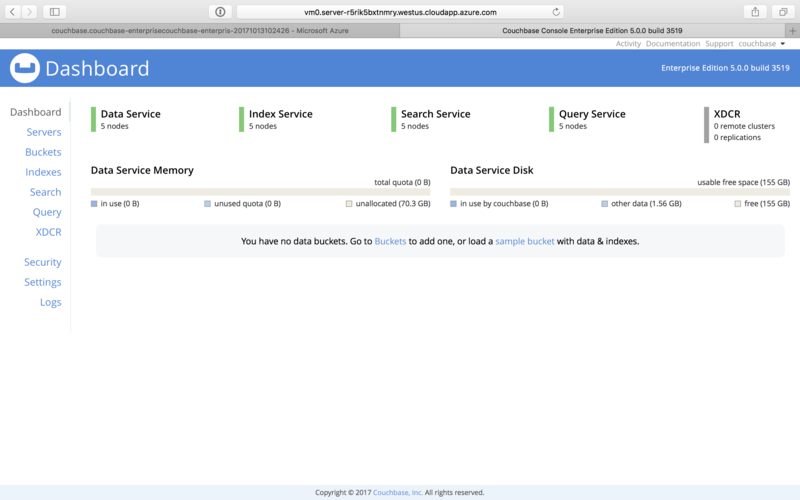 Deployment begins right after you click Purchase and is indicated by the blue Deploying Couchbase tile on your screen. You can click on the Deploying Couchbase tile to examine the progress closely. Note that it takes a few minutes for deployment to complete. You will receive a notification once deployment is completed. After the deployment is completed, you can drill-down into the resource group and explore the items created. The newly created resource group contains four items: network security groups, Couchbase Server VM scale sets, Couchbase Sync Gateway VM scale sets, and a virtual network that contains all these objects. 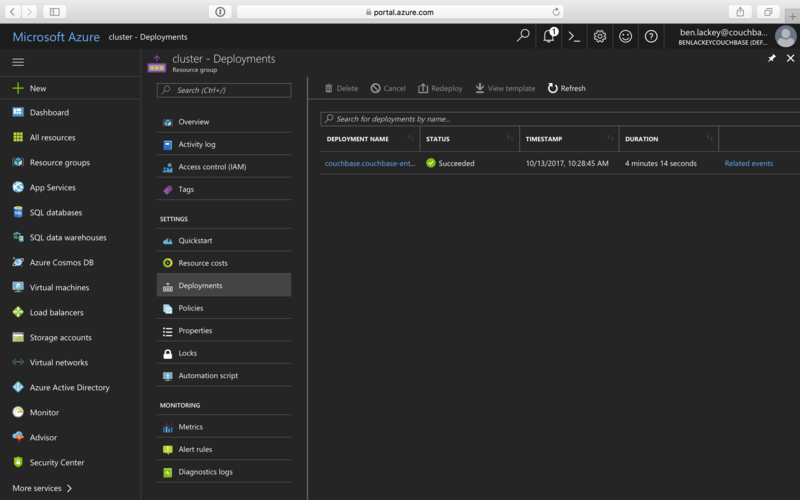 Navigate to the newly created resource group > Deployments and select the deployment. (For example, couchbase.couchbase-enterprisecouchbase-enterpris-timestamp). You can see that there are two outputs created: Server Admin URL and Sync Gateway Admin URL which can be used to access the Couchbase Server Web Console and Couchbase Sync Gateway Admin Portal respectively. 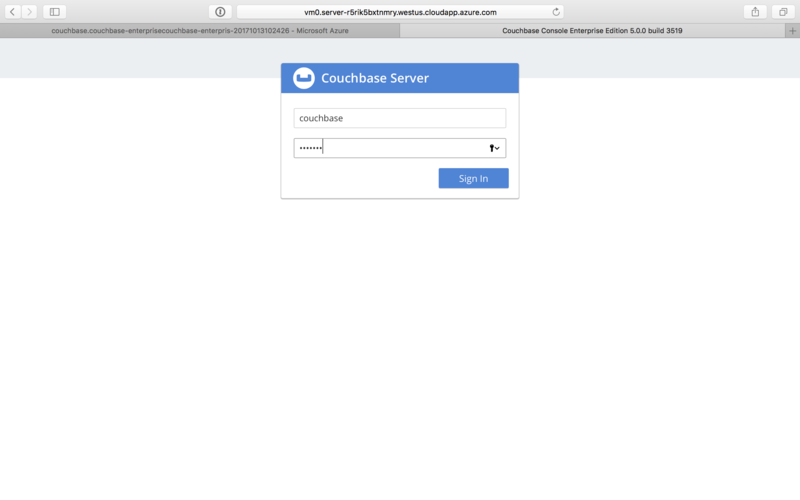 This step describes how to log in to the Couchbase Server Web Console. Copy the Server Admin URL. 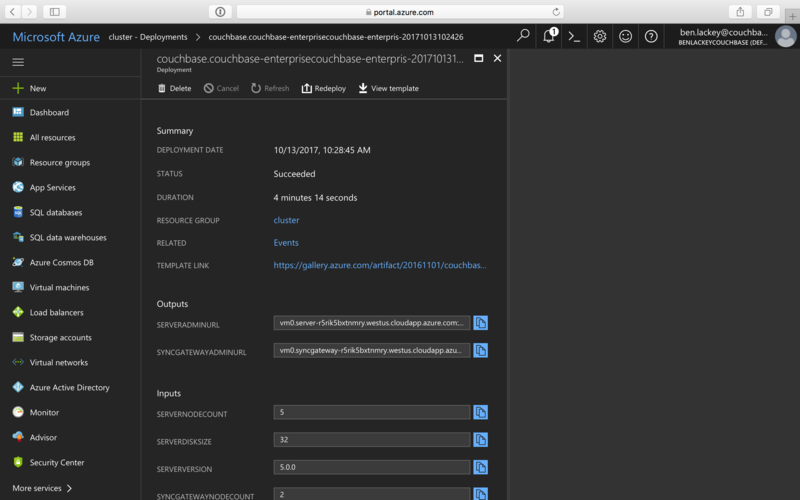 Paste the Server Admin URL on a browser tab to open the Couchbase Server Web Console. Enter the Admin user name and password that you configured when creating the deployment to sign in. Once you log in successfully, you can see the status of your Couchbase Server cluster on the dashboard. Click the Servers tab to explore the sever nodes that have been created. This step describes how to log in to the Sync Gateway Admin portal. Copy the Sync Gateway Admin URL. Paste the Sync Gateway Admin URL on a browser tab to open the Couchbase Sync Gateway Admin portal. 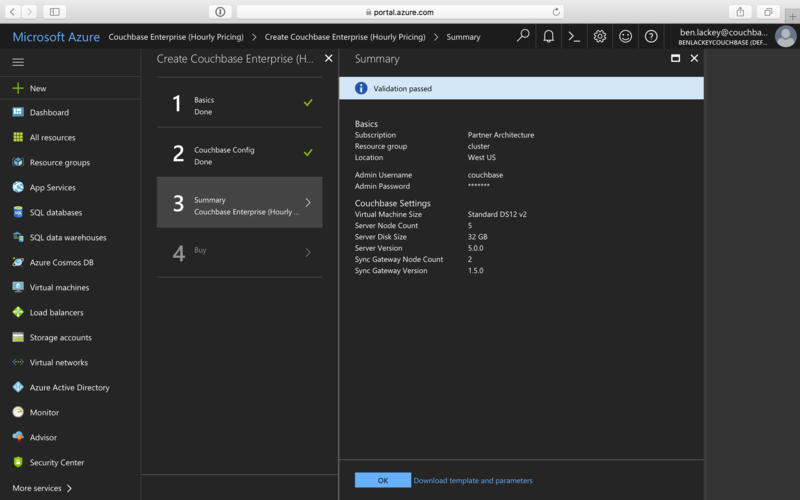 Couchbase simplifies scaling on Microsoft Azure by using virtual machine scale sets. This section describes how to scale up your cluster in three simple steps. 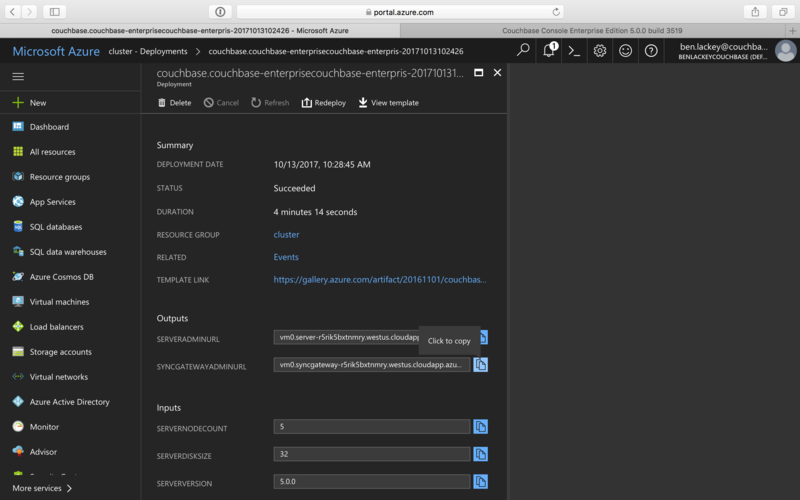 Log in to the Microsoft Azure Portal and navigate to your deployed Couchbase cluster > your Couchbase resource group > server VM scale set. Click Scaling under Settings and move the slider on the instance count up (or down) as needed. Click Save. You’ll see a notification that the autoscale configuration is being updated. Go to Instances to see the updated instance count. In a few minutes, the additional instances will be up and running.